Residents in the eastern walk streets of Venice have just this weekend uncovered two campers that are stationed on their residential streets and rented out as Airbnb accommodations. Joseph Levy, a walk street resident, initially found that a camper squatting on Linden just south of Superba was leaking sewage into the gutter and taking up two parking spaces where there is not enough parking for residents. Linden is also sub-standard in width so the width of the camper made it very awkward for cars to pass each other on the street. As a residential area, this location is off-limits to vehicle dwelling under city law, but the Airbnb guests initially refused orders from the LAPD to leave the area - probably because it was not their vehicle. Below is the Airbnb advertisement for the camper. It was being rented out for $54 a night. I have underlined the warning about maxing out the sewage holding tank. This suggests that at over 75% capacity the tank leaks sewage into the street, which is what Mr. Levy witnessed. Guests must not allow holding tanks to get over 75% capacity under any circumstances. The water tank is 25 gallons so you will need to try to conserve water whenever possible. The hot water heater is 6 gallons so you have to be very efficient when showering, etc. if you run out of water during your stay I need to dump the first water tanks and fill them with fresh water. Dumping can only be done at certain times and requires briefly moving the rv to the dump station. Power is provided by solar so you also have to watch your energy consumption, as well. There is a Bluetooth app and meter to watch the battery level but I might need to start the rv and charge the batteries during your stay, as well. 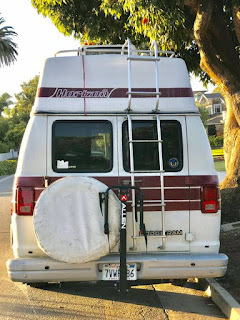 It is a little tricky if you have never stayed in an rv before but it is easy once you figure it out. I am happy to help with whatever you need during your stay. Full size bed with folding memory foam mattress on top and the Sofa folds into another full-size bed Solar Nespresso Machine, 24” Smart TV with Roku, Solar Fan, Bluetooth Speaker, Lithium Power Pack with 4-USB and 2-110v Plugs, Sink, 2-Burner Stove and more! 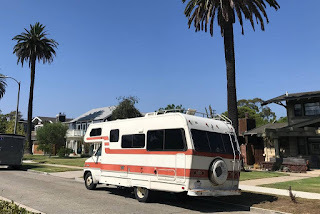 Venice Beach is an amazing location and This Solar RV is Super Cool if you like vintage style that is non-luxury. He comes loaded with Jackery 240 Lithium Power Station with 110V Outlet and (2) 2.4A USB Outlets for Charging your devices, 24" Smart TV With Roku (Netflix, HBO, Hulu, Amazon Prime Movies Available), Kitchen Utensils, Cookware, Board Games, Bedding with Pillows and Sherpa Throws, 200W Solar System, Ice Cooler, Bluetooth Speaker, French Press, Fresh Coffee, Tea and More! It is currently parked about a mile from the sand, near Lincoln Blvd and Venice Blvd but I can deliver to Parking Lot at Venice Beach for $25 a night (emphasis added). These clearly illegal appropriation of public parking for personal profit raises the question if there are other vehicles used as dwelling units in parking-short Venice for personal gain. There have been reports for years of several mobile Airbnbs around the Venice Post Office. Tell the MTA Board you oppose the Bridge Housing homeless shelter planned for the Venice MTA lot on Main Street. The board will vote on a lease agreement with the City of Los Angeles on February 28th. As you know, the VSA has filed a lawsuit demanding a proper environmental review and Coastal Development permit for the project, and necessary mitigations, so that it does not become a huge burden on nearby residents. However, we can avoid the uncertainty of a legal fight if the Board votes against the lease. I am writing to ask you to adopt the WRAC motion opposing SB 50. If passed, SB 50 would take power away from local government (and the Venice community) and allow the State Legislature to frame planning and development decisions from Sacramento. In the new special zones, regulatory parking minimums would be sharply reduced and zoning codes would have to allow buildings to be either 45 or 55 feet tall depending on local factors. The biggest short-term impact of these zoning changes would probably be felt in neighborhoods that are already gentrifying and have a significant amount of housing turnover. Single-family homes that today are sold to flippers or to yuppies looking to undertake a renovation project or new construction would instead tend to get sold to small-scale apartment developers who would refashion them as denser and much higher structures. The demand for density, however, is highest in rich neighborhoods where the price of land is highest. Units in these neighborhoods turn over more slowly, but the market demand for more housing is essentially infinite so over time it’s easy to imagine whole swathes of single-family dwellings in Silicon Valley, Westside Los Angeles (including Venice), Western San Francisco, etc. being converted to apartments. With many high frequency bus stops in Venice it is not a stretch to imagine four and five story buildings all along Main Street, for example. If the Venice community wishes to increase density, for example, along broad corridors such as Venice and Washington Boulevard, then the current Local Coastal Plan and community plan processes are the appropriate means for its expression, not the sledge hammer approach of SB 50. As former County Supervisor Zev Yaroslavsky explained last year in opposing SB 50's look-alike predecessor SB 827, this legislation is neither NIMBY or Yimby; it's WIMBY - Wall Street in My Backyard. SB 50 simply allows developers to finally be able to over-develop our low rise, livable community without the careful consideration and mitigation that would come within the community plan process. Please send the following message to the Los Angeles Planning Commission opposing Venice Community Housing Corp's proposal to build the first four-story building in the Oakwood neighborhood. As is readily evident from the previous meeting notice, the project will dwarf everything else in Oakwood and set a dangerous predecent for future development. 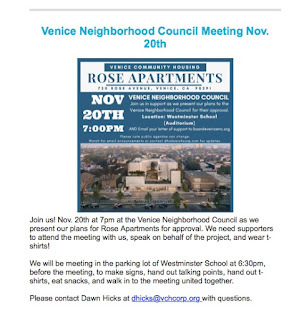 The VCHC is soliciting non-Venice residents to deluge the Commission with emails. We need to fight back to protect Venice from over-development. 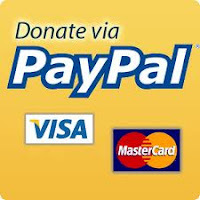 Please oppose the VCHC's 718-20 Rose Avenue project. It is too tall, too dense, has too little parking, and is way out of character with Venice. It is extremely out of step with both the Venice Specific Plan and the desires of residents for Venice to remain a low-rise community. Approving its 45-foot height and almost no parking will set a dangerous precedent. Send it back to the drawing board! Please send your message of opposition today; the hearing is this Thursday!